YOU MUST TRY THIS!!!! I don’t say that lightly! If you like chocolate, then you gotta have this. Even JF, who likes chocolate, but maybe wouldn’t DIE without it (like I would), thought this was unbelievable. He kept saying “wow” and “oh my god”. Good enough for me. This may not look like anything special, but I believe the best part of this is not the decadent gooey insides (though that is really good too!!) it’s the crust. It forms this crisp layer on the top, which combined with the softness… ooohhhhhhh. What more can I say? The recipe? You got it. I got a cookbook from the library a couple weeks back by Ina Garten “Back to Basics” and immediately knew I wanted to try this. I just didn’t know how much I would love it. I halved the recipe, but next time you can be sure I won’t do that! lol I also cut back on the butter, and was none the worse. That’s it. So simple right?! Preheat the oven to 325. Butter a baking dish. I used 8×8, but I feel it came out slightly thin. Next time I would LOVE to try this in individual ramekins. Wouldn’t that be adorable? 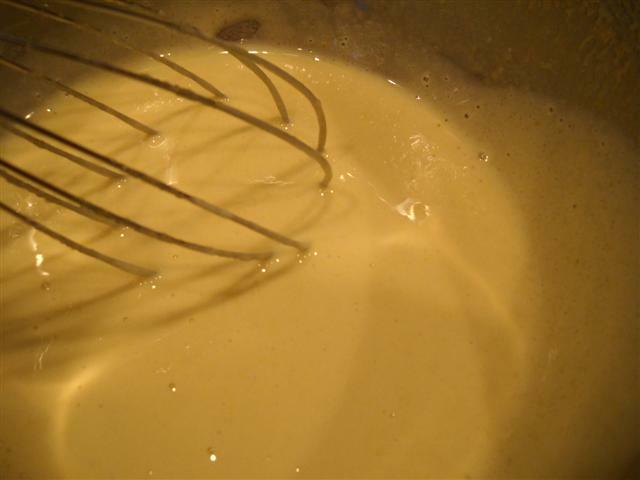 With an electric mixer or a whisk by hand, beat eggs and sugar on medium high for 5-10 minutes or until*very thick and light yellow*. I think this is a crucial step for the texture of the final product. And I am just crazy enough to have done this by hand with the whisk (still don’t have my hand mixer available). Yes, my arm hurt, but, nothing would stop me. I needed this to come out right! Add in the vanilla. In another bowl sift the flour, salt and cocoa together. I considered skipping this (Im lazy and I don’t like dirtying more dishes), but then I didn’t want clumps of cocoa here and clumps of flour there. So I did it. Stir this into the egg mixture until lightly combined. Then slowly add the cooled (melted) butter and mix until just combined (dont overmix). Pour the batter into the baking dish and set the baking dish into a larger pan (I used a 9×13). 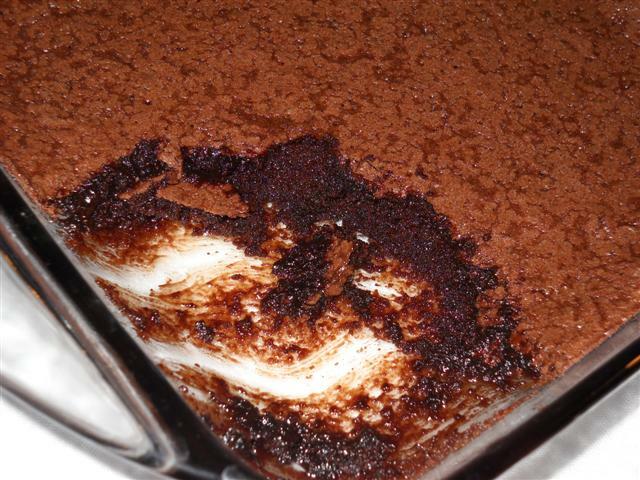 Put it in the oven and then pour hot water in the large pan halfway up the baking dish with the brownie pudding in it. Do this carefully. It helps to pull the oven rack out before setting it inside. Hope that made sense. Since mine was thin, it only took about 40-45 minutes, but the double(full) batch needs to bake 1 hr. Its tricky knowing when this is done, since it will still looked underbaked. Ina says “a cake tester inserted 2 inches from the side will come out three-quarters clean.” if that helps. I recommend to serve warm with ice cream. Link to the full recipe is here and this blogger cut the butter even further, plus her pic looks delicious. These were really yummy with chai or great as an afternoon snack. Even better, this would be nice to serve to guests when you want to make something hot and tasty. Got the basic recipe from Ina Garten but added my own ingredients. I halved her recipe and it still made 12! In a 2qt pot bring water to a boil (lots of water, at least half full- you will drain the rice anyway). Once boiling add salt and the rice. Cook, stirring occasionally, for 15 mins or until the rice is quite soft. Drain and rinse with cold water to cool. Continue to drain while you assemble the rest of the stuff. In a bowl, beat the egg then add the other ingredients (except bread crumbs). 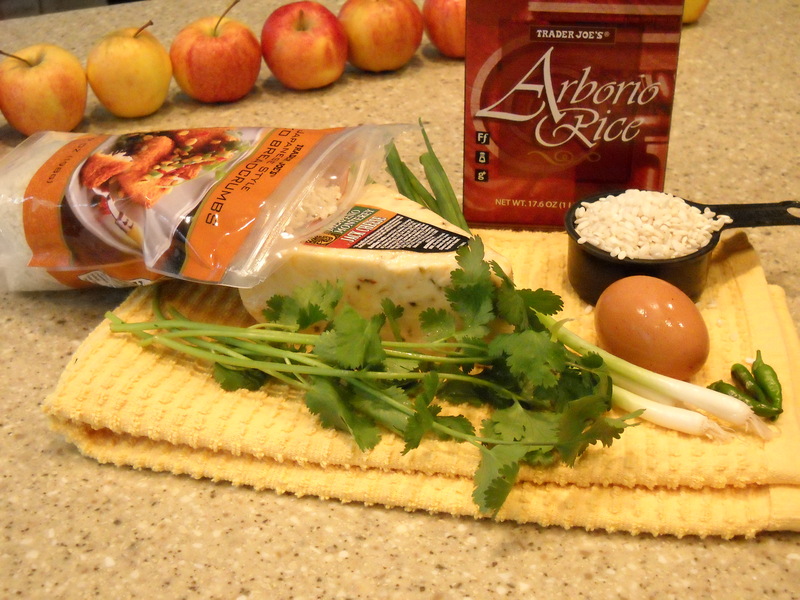 Add in cooled rice and mix well. **READ THIS BEFORE YOU BEGIN** You need to refrigerate this mixture (covered) for at least 2 hours or overnight. Oops. I didn’t read that. And I have hungry bellies waiting. I only refrigerated mine about 10 minutes but they would’ve been easier to work with if firm. Oh well, still delish! 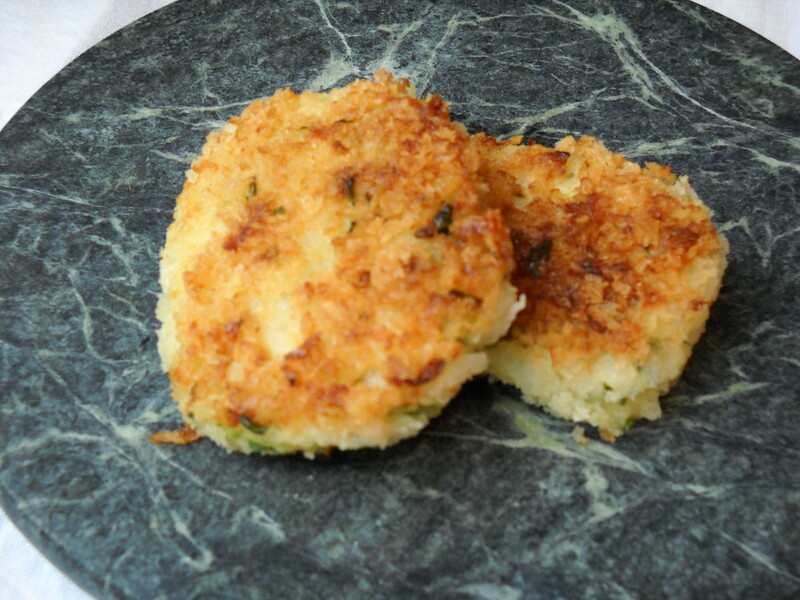 Form into patties and coat with the breadcrumbs. I wanted to photograph this step, but I forgot. Forgive me? Coat the bottom of your heated skillet with oil and fry in batches of 4-5, flipping when browned. These are deliciously crunch on the outside (I love crunch) and creamy on the inside!! Heaven. Ina says these keep warm in a 250 oven for 30 minutes. We had them as is, but they would be good with mint or chilli chutney too. A more traditional Italian version here.